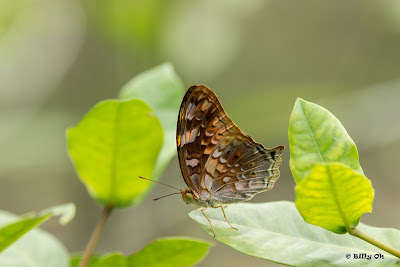 Butterflies of Singapore: A Loitering Vagrant captured in Singapore! A vagrant is generally understood as "one who has no established residence and wanders idly from place to place without lawful or visible means of support". 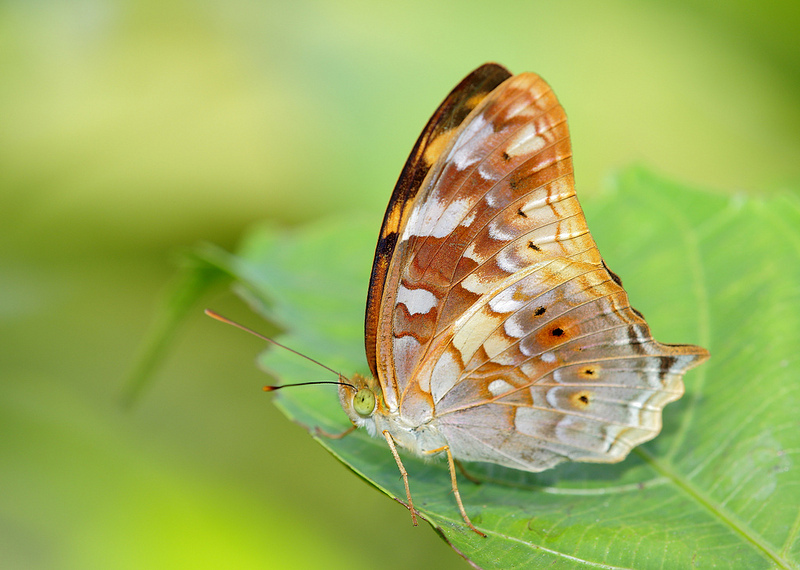 It is therefore a curious name for a butterfly to be named as such. But, knowing the myriad common English names and their possible origins, trying to find the genesis and rationale of a butterfly's "given" name is often a question of guessing what the author saw or experienced at the time he coined a name for the species. Recently, in Singapore, a "long-lost" species, the Vagrant, was seen on two separate days at Gardens by the Bay. Newbie ButterflyCircle member Billy Oh, had posted a couple of shots of this species as he could not identify what he shot. It turned out to be our first re-discovery of this year! The Vagrant was in the checklists of the early authors, but has not been seen in Singapore for at least the past three decades or more. Then all of a sudden, it re-appeared. This pristine individual was seen in the vicinity of one of its caterpillar host plants, Flacourtia sp. that is found at GB. The following day, when ButterflyCircle members went hunting for the species, member Koh CH was fortunate to encounter it again in the early hours of the morning. As it is a skittish and always on-the-move species, it was difficult to track and photograph it. Also, as the species shares the same host plant (and also behaviour) as the related Leopard (Phalantha phalanta phalanta), and which coincidentally also looks and behaves like the orange-coloured Vagrant in the field, searching for the Vagrant proved more challenging than anticipated. The individual sighted is relatively pristine and in very good condition, suggesting that natural migration by flying over from Malaysia may be unlikely. Also, the Vagrant is not a known migratory species, nor is by any measure a particularly strong flyer. The month of June is typically the season with south-westerly winds blowing from Sumatra, hence any migration aided by prevailing winds from the north in Malaysia can be ruled out. Whilst the species may have come from the Riau archipelago is a plausible theory, evidence of the Vagrant's existence in nearby Batam or Bintan is sketchy. 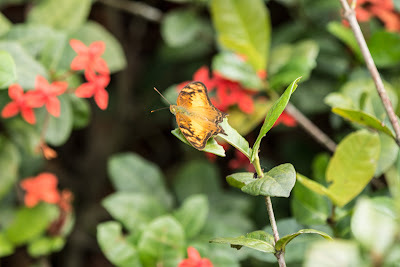 The import (from Malaysia) of two of the Vagrant's host plants, Flacourtia rukam and Flacourtia inermis and cultivated at Gardens by the Bay could be a possible 'vehicle' on which the early stages of the butterfly could have stowed away and entered Singapore. However, the plants at GB are already quite mature and have been brought in since the previous year prior to the opening of the Gardens at Bay South. Hence it may not be anything recent and the species may have been already breeding on the plants at GB. The Vagrant is typically a forest-dependent species, but as with the Rustic (Cupha erymanthis lotis) another Flacourtia feeder, may have been attracted to the urban coastal park due to the abundance of its host plant. Will the Vagrant be seen again anytime soon? It was surprising enough that it re-appeared in Singapore after all these years, and even more surprising to find it at an urban downtown park like Gardens by the Bay! Are there young caterpillars breeding on one of the many Flacourtia trees, just waiting to show themselves again soon? No one can never say for sure. But we certainly hope that the Vagrant will continue to stay on in Singapore and add to the diversity of butterfly species that can be found on our little red dot. Footnote : The taxonomic name of Vagrans sinha sinha is used here, instead of the earlier references to the species name as Vagrans egista macromalayana due to a series of recent papers by Tsukada (1985) Treadaway (1995), Vane-Wright & deJong (2003) and Smetacek (2012) regarding the status of sinha vs egista in the Sundaland taxon.